One of my sponsors, Williams Sonoma, has asked me to choose a couple of my favorite products from their line that I find the most useful in my everyday recipes. Le Creuset has always been a definite favorite of mine. It's versatile and I use it for soups, stews, and roasts. I've had mine for years and with a little care, its really one of the most durable items in my kitchen. The Kitchen Aid mixing stand is on my wishlist for my birthday so I had to choose this one! I've been getting by with my little hand mixer, but the Kitchen Aid would make whipping up intricate desserts that much easier. I've used it several times in professional kitchens and it really makes a great difference for everyday cooking. What are some of your favorite products in the kitchen? I think my old cast iron skillet has to be my favorite. I bought it at an antique shop many years ago. It has a finish like a non-stick pan at this point and cooks like a dream. That big le creuset looks amazing though!!! Well, I'm right there with you on the La Crueset - I can't live without my dutch oven! I would have to say some of my favorites are my microplane grater, which handles everything from Parmesan cheese to lemon peel. Also my Silpats, which are silicone mats that are primarily meant to line cookie sheets, and nothing -- I mean nothing! - sticks to these babies. Also great for rolling pizza and pie crust. And last but not least, my Rival crockpot. Beef barley soup. Amazing tomato sauce. Even chocolate cake -- all in the crockpot. Well, I do love my le Creuset bouillabaisse pot, because it has sloping sides and it's perfect for stirring risotto. My KitchenAid mixer I could not do without. I make pasta with it, bread, pizza dough, mix large batches of cookies and cakes. I even grind my own meat with it. It's just an incredible workhorse. And I love my Cuisinart food processor! I've always wanted one of those not just ecause they're great quality but also because they look gorgeous on the stove. My favorite is the orange. I love my Le Creuset pots, too. They work well and are beautiful. Love the Le Creuset Dutch oven, love the KA mixer...of course, I need to include my panini grills on the list. I also get a ton of use out of my toaster oven, probably use it at least twice a day. My newest gadget - still in the box - is my Beaba Babycook. It's supposed to steam and purée baby food. It was a gift, I'm anxious to try it. I love my Kitchen Aid mixer. And i cant leave without my grill. I cook everyday, bread, cookies, dinner everything...even ice cream. So i got a lot of small tolls :) But I think about Creuset pots..i never had one.. I love all the baking pans from Wiliams-Sonoma since I do lots of baking. The gold line is absolutely wonderful. My favorite products would have to be my KA mixer, but I didn't get it from W-S. My favorite product from W-S would have to be my Wustof knife. It's definitely my multi functional blender! I got a Le Creuset dutch oven last year, and I don't know how I lived so long without it. They are good for everything! You are so right. My kitchenaid stand mixer is wonderful. I use it several times a week! And my cuisinart food processor gets a lot of use. My immersion blender when I'm in the mood for pureed soup (which is often!). I love my cast iron skillet. It really does cook like a dream. I also really can't be without my small kitchen tools too. My mircoplane zester I use for just about everything, from grating garlic and ginger, to zesting citrus, to shredding parmesan cheese, and grating nutmeg. Also, since I lost my job I've been trying to save money on food where I can, so I've been buying dried beans since they are ridiculously cheaper than canned, and just take a bit more planning. I use my slow cooker a lot more now, since it is perfect for cooking beans. Just 4 hours on high and they turn out awesome! My kitchen aid mixer is my favorite for baking, but I love my big chopping knife when I cook...I feel so powerful chopping up veggies with it! If the house was on fire and I was told I still had a chance to get one appliance out of the kitchen...I would absolutely have to grab my toaster oven. What don't I make in there. I've fit a large pizza, cake, muffins, pie as well as a whole chicken! All made pretty successfully indeed! I saw that picture and recognized it as one of my favourite things in my kitchen. I also love my KitchenAid mixer,my Wolf oven, my Santoku knife and my Gaggia Titanium espresso maker. I looove my Kitchenaid - in pastry school when we had to make a chocolate sculpture of our favorite toy I made a life-sized chocolate Kitchenaid! I'm also in constant adoration of my Vita-Mix and am quite attached to my ice cream maker. I love my kitchenaid mixer and my magimix food processor, they're both red! they are so useful, i don't know how i lived without them. i would love some le crueset too. I am completely in love with my 50-year old, manual Universal orange squeezer, which for decades has made quick work of the citrus coming out of my garden. Aside from its reliability and utility, I consider it the most beautiful kitchen object I have ever seen: a large, gleaming, sleek, curvy, perfectly designed tool that serves me as kitchen art when not in use. I would have to say my most used product is the KitchenAid mixer and all of the attachments that we have for it. It is definitely used the most. 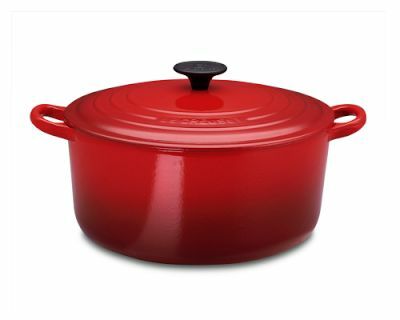 Second would be my le Creuset dutch oven. We just got it as a gift but have put it into great use since! I just got a Le Creuset this year--it's my new favorite toy. But I couldn't give up my KitchenAid (hand-me-down from Mom), my chef's knife, or my microplaner!! Le Creuset is such a good brand and you will cook with it all your life:! I have a smaller le creuset and am having pan envy! I think my favorite is my all-clad saucier, i make a lot of sauces. I have to agree with you on the Le Creuset and KitchenAid mixers. I also love my Global Vegetable Knife. It's become my go-to knife for all chopping tasks, both large and small. It fits perfectly in my hand, holds its edge forever, and is neither too large or too small. I love all of my Le Creuset pieces but my most favourite is my 13 quart French Oven. When I cook with it guests can't believe how big it is and always say I am sure you don't use this very often because it is so large, quite the contrary really because I use it for everything, I make large quantities and then freeze, pasta sauce, stews etc.. One purchase I have never regretted. I've built a large collection of Le Creuset and plan out passing them to my children done the line, such a great investment and their service is above and beyond!